Durgapur makes a perfect weekend getaway from Kolkata if you are looking to spend quality time with your family and children. Even though it is one of the major urban centres in West Bengal and doesn't have myriad places of interest, it is still an ideal picnic spot due to the presence of beautiful parks and gardens. So, how about planning a trip from Kolkata to Durgapur now? Apart from savouring the beauty of its gardens and parks, you can also explore its historical monuments. Read on to know more about Durgapur and its places of interest. The best time to visit Durgapur is from October until the end of March. During this period, the temperature remains below the average level, thereby, making surroundings cool and pleasant. It is advisable to avoid visiting Durgapur during the summer season due to hot weather. By Air: Kolkata airport is the nearest airport to Durgapur which is located at a distance of about 170 km and is connected to all major cities in the country. By Rail: There are several direct trains running between Kolkata and Durgapur. You can catch a direct train from Kolkata railway station to Durgapur Junction. By Road: It will take you an approximate time of 3 hours to reach Durgapur from Kolkata by road via NH19. On your way to Kolkata, you can also get down and take a break at Bardhaman and explore its beautiful surroundings. Bardhaman is the perfect place to take a break en route to Durgapur due to its beautiful surroundings which comprise of a river, ancient temples and several beautiful gardens. Even though the exact date of its formation is still unknown, it is believed that Bardhaman has been living since the era of the Stone Age. Today, it is popular amongst tourists for its temples, gardens and the beautiful Damodar river. If you are in and around the ancient town of Bardhaman, Curzon Gate, 108 Shiva Temple, Hawa Mahal and Damodar River Beach are the places which you must not forget to visit. Durgapur is one of the most significant cities in the state of West Bengal and is located in the Paschim Bardhaman district. It is also one of the most planned cities in India and is located on the banks of Damodar river. It is generally famous for its steel industries and several other factories. However, unknown to many, Durgapur is also home to several beautiful parks and numerous historic buildings. Apart from industries, following are the major places to visit Durgapur. 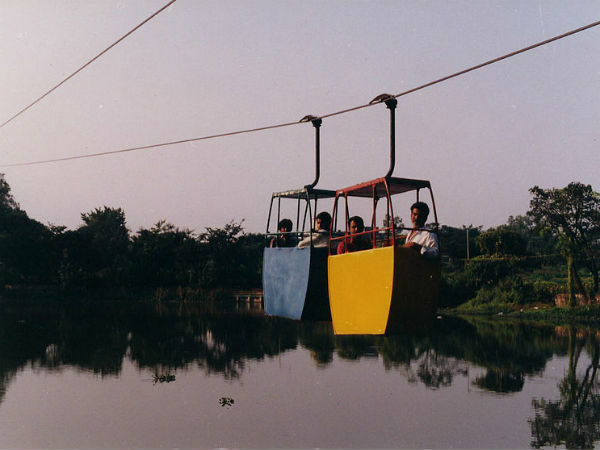 Troika Park is one of the most visited places in Durgapur and is famous for its boat rides, cable cars and several water sports. It is also known as Anand Amusement Park and is definitely a place to chill out with family due to its peaceful and amusing environment. From boating in its waters to enjoying cable cars, there is a lot to do in Troika Park. Bhabani Pathak's Tilla is an interesting place to visit to savour the beauty of Durgapur. It is a maze of tunnels which starts at the city centre and opens up at Damodar river. You must visit this wonderful place if you exploring the majesty of tunnels. Due to historical significance, it also attracts several history lovers too. Being one of the prime attractions, Bhabani Pathak's Tilla is visited by hundreds of tourists every week. Kumaramangalam Park is another beautiful place in Durgapur which should not be missed by anyone. Being one of the largest parks with a small lake, it also offers its visitors with the opportunities of boating. Kumaramangalam Park has numerous fountains and flower gardens. Due to its colourful environment, it has also become a weekend destination for several photographers. Deul Park is famous for its beautiful trees and colourful lawns covered with squashy grass. The major thing which distinguishes Deul Park from other parks in Durgapur is its delightful environment, surrounded by historical monuments. It also has a toy train which is the prime attraction for children.